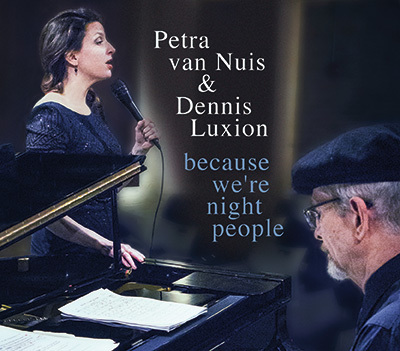 Petra van Nuis (vocals); Dennis Luxion (piano). Duo albums and gigs seem to have become more and more prevalent these days. Usually, it's for economic reasons. Fortunately, at other times, and this is just such an occasion, it's the artists' desire to create something intimate, personal without the intrusions of drums, basses or horns. Almost every duo album these days acknowledges the inspiration of Ellis Larkins, who, on record with either Ella or Ruby Braff, more or less etched the ground rules in vinyl. Street of Dreams; Night People; The Piano Player (A thousand and one saloons); Moonlight Saving Time: You and the Night and the Music; While my Lover Sleeps; Small Day Tomorrow; Dreamsville: No Moon at All; The Night We Called it a Day; Shadows of Paris; Black Coffee; Count Your Blessings.